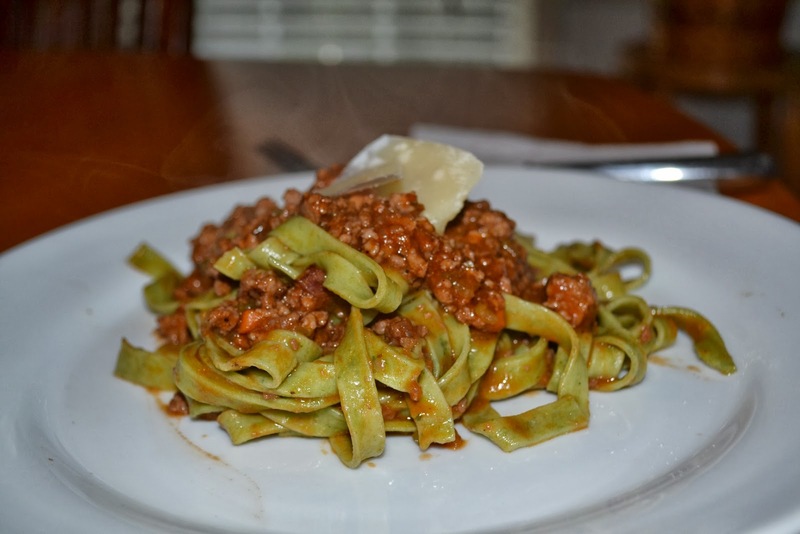 Pasta Bolognese is a meat sauce originating from Bologna, Italy, and more importantly, it is a hearty Italian dish that we love to have every now and again. So behold, Pasta Bolognese. Inspired by the pasta experts at Storico Fresco and delicious bacon from Pine Street Market, we returned from our local farmers' market with some fresh pasta and pork and a challenge to make something great. We Googled around and found a great recipe here. Based on the recipe, we gathered our remaining ingredients. Pretty simple plan. Make the sauce first as it takes the longest. While the sauce is cooking, you can prep your salads and put in fridge until you are ready to eat. They are better really cold anyway. You'll make your pasta to coincide with the finishing of your sauce, which will depend on whether you are using fresh or dried pasta. over the mushrooms and letting them steep for about 20-30 minutes. 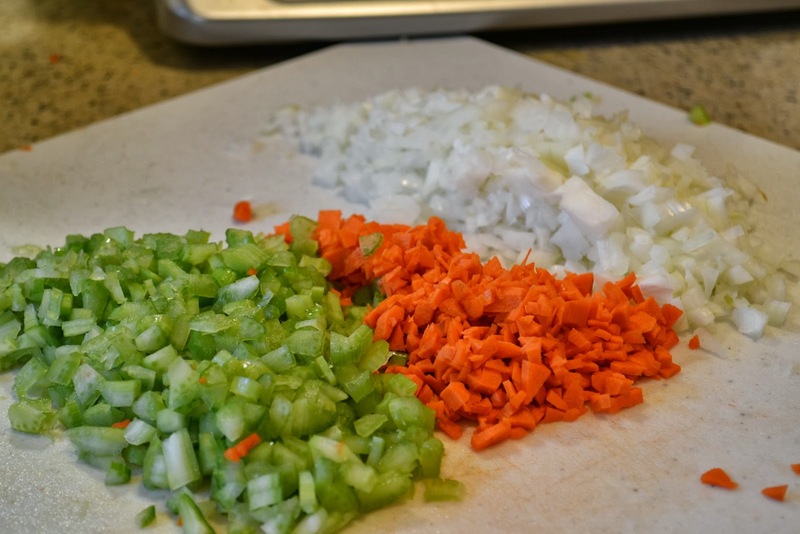 Dice up a classic mirepoix (onions, celery and carrots). Typically you use a ratio of 2:1:1 of onions:carrots:celery. We used 1/2 cup diced yellow onion, 1/4 cup diced carrot, 1/4 diced celery. renders its fat and begins to brown. 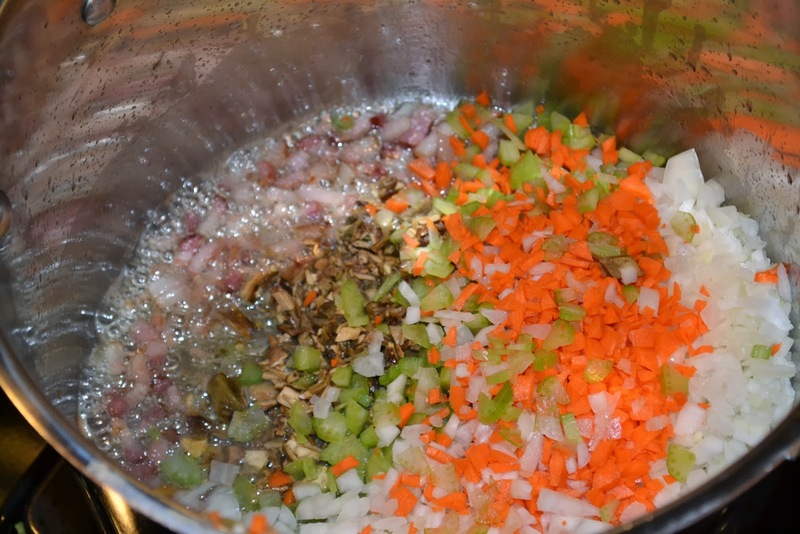 Then add your mirepoix, minced garlic and hydrated mushrooms to the sauteed bacon. Reserve your mushroom liquid for later. Sweat your vegetables for about 10 minutes, until the vegetables become soft. 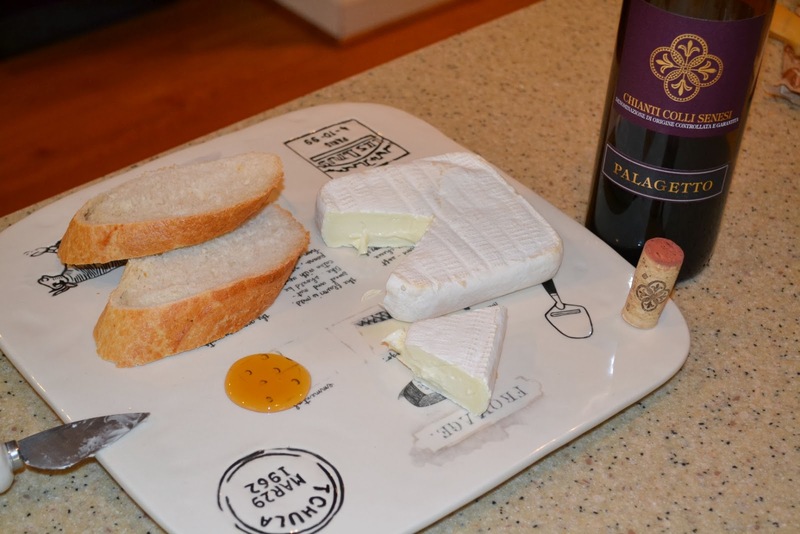 In the meanwhile, you should always have good wine and cheese to provide you stamina during the cooking process. And the idea is to make something great AND have fun along the way. 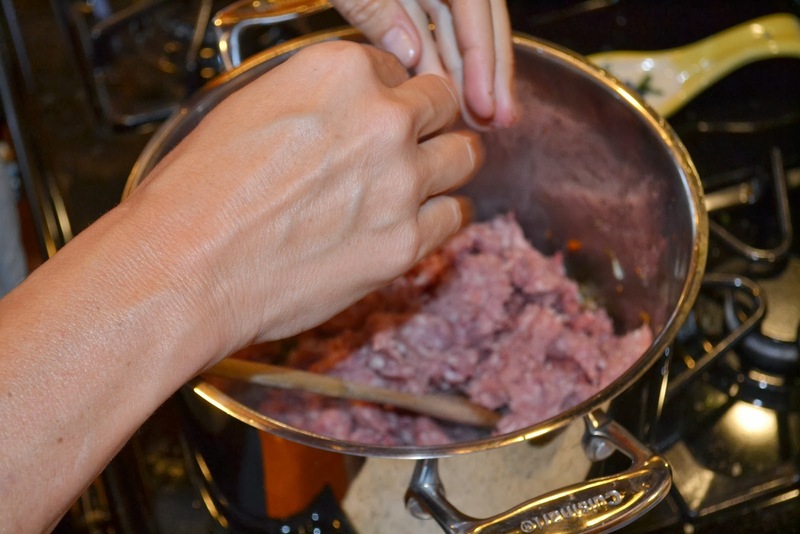 After about 10 minutes, add in the 1 pound of ground pork. You can really use any combination of pork, veal and/or beef here. It is up to your taste buds and sense of adventure. (we call it pork-on-pork crime = bacon AND ground pork). Your kitchen should now smell so fragrant from the sauteed aromatic vegetables, garlic and pork. Now add in 2 cups of crushed San Marzano tomatoes (if you can get them, they really are superb), or any crushed tomatoes will do fine. what you would prefer to drink. Any dry, full bodied red will do great. At this time also add in 1/2 of your mushroom liquid. Now comes the tough part - waiting. 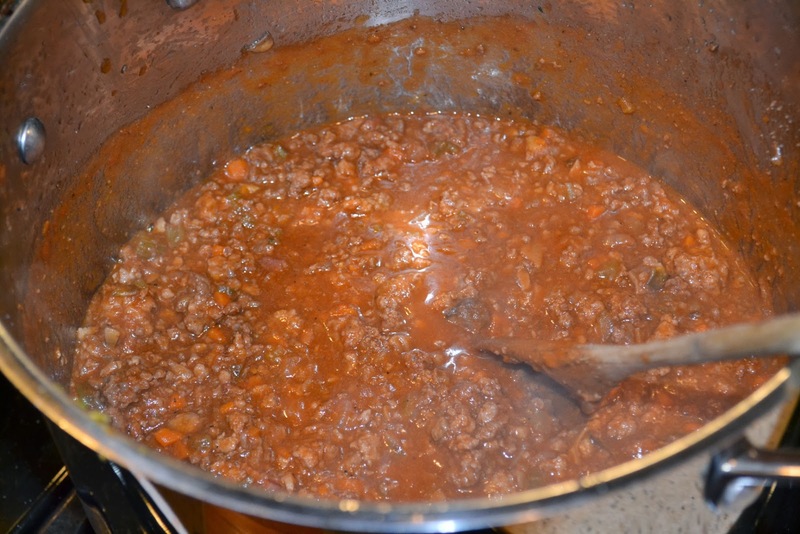 The nature of a good bolognese or ragu is that it is typically cooked for a while over a lower heat. 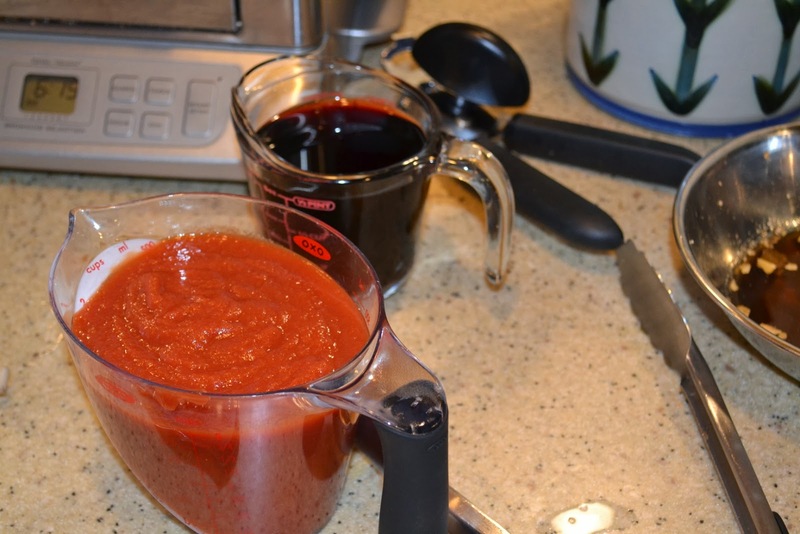 This really allows the sauce to meld together and all of the flavors to develop. 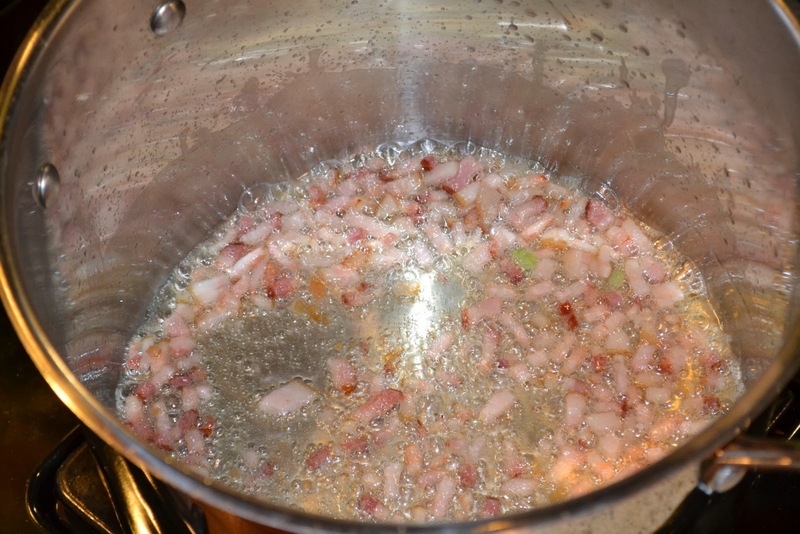 Simmer your sauce over low to medium-low heat for about 45-60 minutes. During this this time if your sauce becomes a little too thick. add in some of the reserved mushroom liquid to thin it out a little and allow you more time to simmer it. 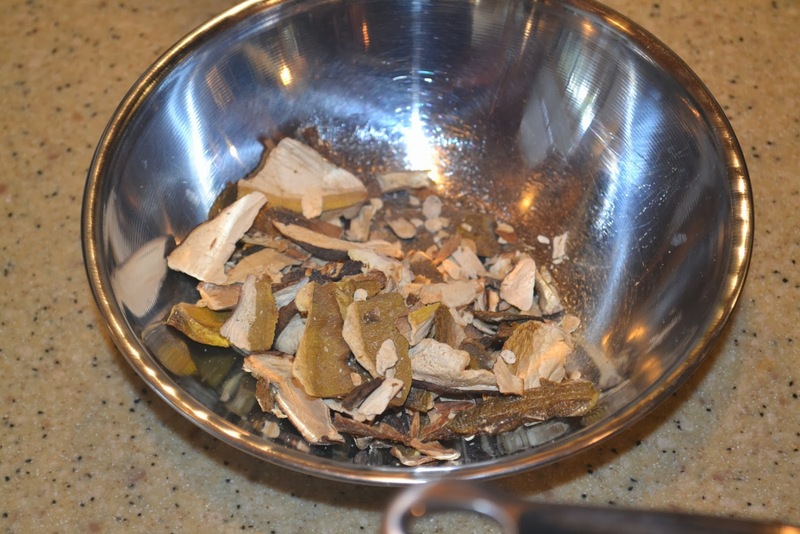 If you run out of mushroom liquid before it's done, you can add warm water. While your sauce is simmering, prep your salads. 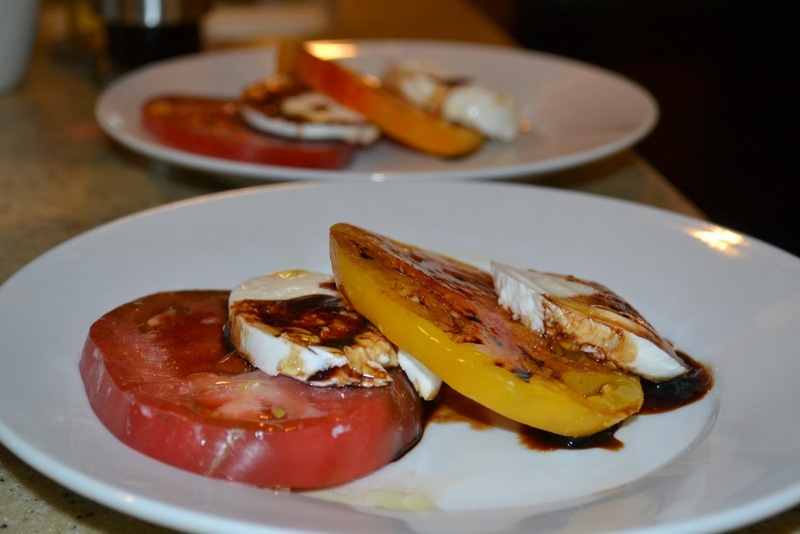 This is a classic Insalata Caprese, minus the basil. Cut thick slices of a fresh tomato. We used red and yellow for the aesthetic value. Do the same with some fresh mozzarella cheese or bufala. olive oil and sea salt. Voila - beautiful and simple salads. 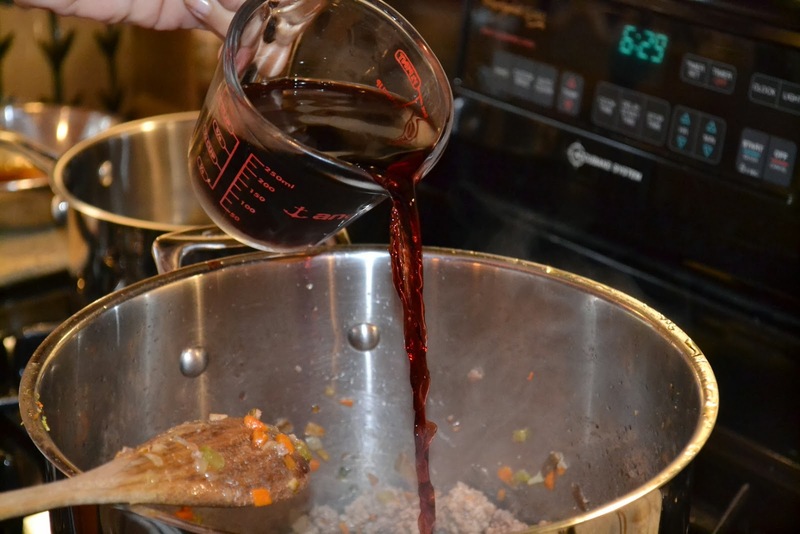 Meanwhile, back at the sauce pot, you'll know the sauce is ready when it's simmered for at least 45 minutes, the colors deepen and it becomes more thick. Of course, the sauce will be even better the next day, but if you're eating it the day you make it, at least 45 minutes of simmering should be sufficient time to develop the flavors. 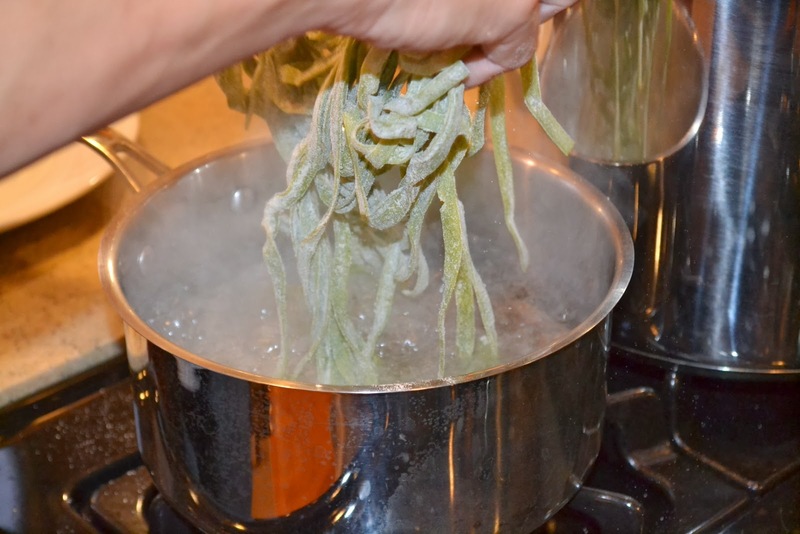 Once your sauce is within 10 minutes of being done, begin to cook your pasta. You can use most any shape pasta, but the best to use with this sauce are broad flat pastas (pappardelle, tagliatelle or fettucine) or short tubes (rigatoni or penne). 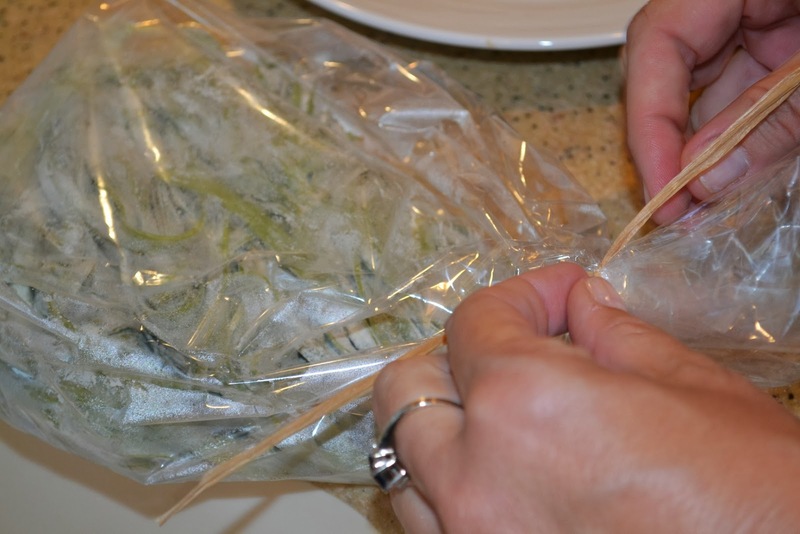 Cook according to package directions if using a dried pasta. We had the good fortune of picking up fresh pasta from the farmers market, which takes only 3-4 minutes to cook. We used here a spinach fettucine. At last, it is time to eat. Pour yourself a nice red wine and enjoy the fruits of your labor! We loved this. 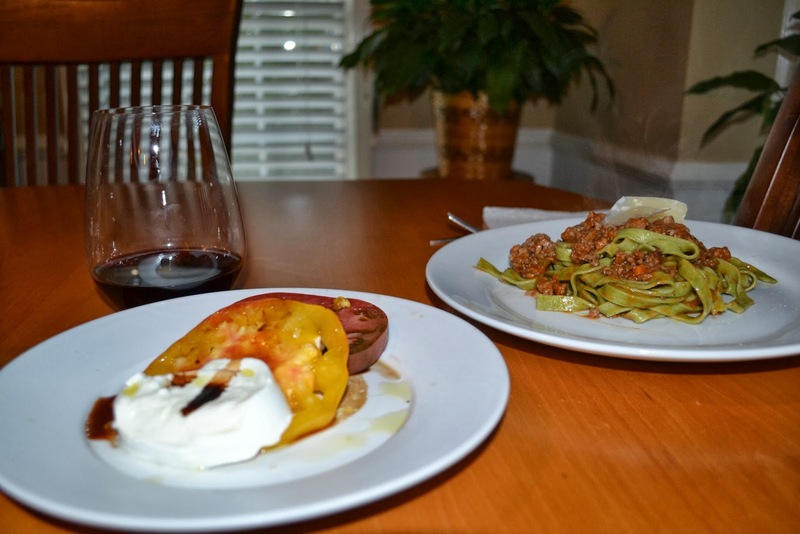 It is hearty and has a great pork flavor, and when coupled with the coolness and acidity of the salad, it is hard to beat. There isn't anything we would have done differently on this one and look forward to making it again. Also, you can freeze the bolognese sauce and use it again when you have more fresh pasta if you have access. In fact, the sauce is much better the next time around.